Blogger went back online around noon...but I was in the middle of eating lunch with Cherlin that time then we had to go to Clarise's Field Day, so I didn't have enough time to do my post. When I got back home and was all set to do it, I found out that even the recipe that I already typed on Blogger last Wednesday night is gone, so I have to start over again! It really is Friday the 13th hah! But I know technical glitches like that can happen regardless of the platform you use. I was so annoyed with Blogger since last night that I considered moving my blog to Wordpress. So I registered and started designing my Wordpress blog...then this question suddenly popped into my mind: "Am I sure that this won't happen to Wordpress?". I must admit that I like the layout on Wordpress better. But isn't blogger more stable because it is owned by Google? I'm really having second thoughts about moving to Wordpress. I would greatly appreciate if anyone who has done the swap share some thoughts on this with me. 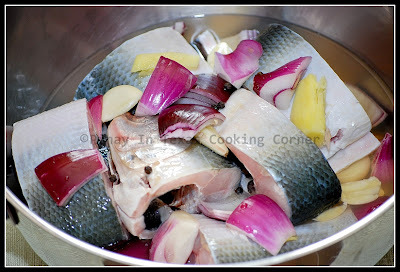 This recipe that I'm going to share with you is the easiest and most common way of cooking Bangus (Milkfish) in the Philippines. 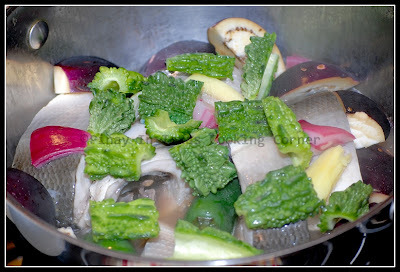 It is called Paksiw na Bangus (Vinegar Stewed Milkfish). Milkfish, by the way, is the national fish of the Philippines. Our country contribute around 55 percent to the total world bangus production. Because of its mild, sweet flesh and its melt-in-the-mouth belly fat, many Filipinos love bangus. But there's one thing that some people don't like about it - it has so much bones. 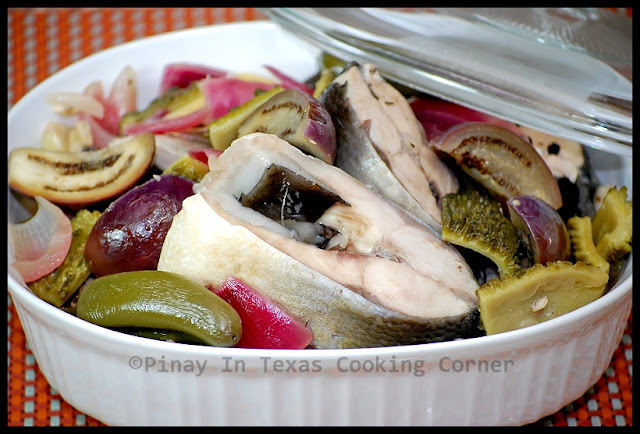 It is said that the flesh of bangus is shot through with about 180 thin spines. But fortunately the spines are in bundles so you don't have to deal with each one individually. It can easily be removed to produce Boneless Bangus which is preferred by many. But for this dish, bangus with bones on works best. 1. Wash and clean your bangus. Remove the gills and the scales. Rub them with salt. Let sit for at least 15 minutes. 2. 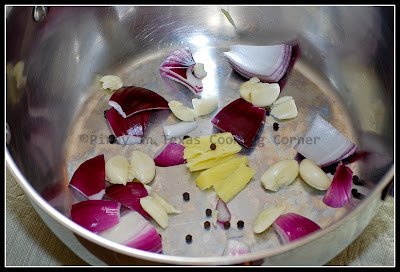 In a large saucepan, put half of the garlic, onion and ginger and some peppercorns. 3. Arrange sliced bangus on top. Add the remaining garlic, onion and ginger. Add water, vinegar and fish sauce. Sprinkle peppercorns on top. Cover and let it simmer for about fifteen minutes. 4. Add the bitter gourd, eggplant and Jalapeño pepper. Continue simmering for another five minutes or until vegetables are cooked. i don;t think i know this fish! but it looks deliciously light .. like it. Hello! Thanks for the follow! I am now your newest follower as well! :) Hope you have a wonderful weekend! i was very annoyed with the glitches too. your recipes look great i'll have to try some out. @Atlanta, Crunchy Diva & Chauny: Tnx for the follow! Eating seafood with your hands is great... I love eating with my hands whenever I can. The recipe sounds great... I don't know where I can get milkfish... is there a substitute? Milkfish is available in Asian Stores. But in case there's no nearby Asian Store in your area, tilapia & kingfish are good substitute. This looks so yummy. I love to find new recipes. I'm glad you post photos with yours. I only use wordpress on my blog, I don't use the wordpress site or I'm sure I would have the same problems as you do with blogger. I think anyhow, at least I've read that they sometimes do have issues (both of them). I spend 12 yearly to have my own site (URL) through e-rice.net. I use wordpress as my blogging platform and I don't have any issues this way. I do have a blogging id at wordpress so I can comment on the ones that require it. Same with blogger. But nothing is on those sites. I guess I should at least put something on them such as a theme or a link to my website ha. This is a very interesting version of paksiw na bangus. We actually cook paksiw with just the bangus and we have a separate dish called acharang ampalaya at talong which has the rest of your ingredients. Love this! I bet the vegetables made it really nice. I love ampalaya. Am following you back on twitter and liked your FB page. Your photos are lovely. Makes me almost WANT to cook! Almost. Well,they fixed everything and I thought I had lost some posts but they came back! Not a big fish fan but my kids are so I might just try it! Wow I have never heard of this before, but it looks like something I would be adventurous enough to try! I'm definitely gonna put this in the memory bank! Found you from the making new friends bloghop, am a happy new follower! So funny when I see you have the same condiments (thanks for the step-by-step pictures, I like it a lot), I feel like I'm ready to cook. 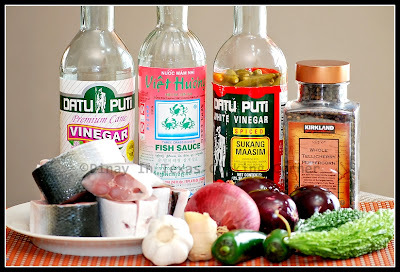 :-D Fish sauce is one of my favorite condiments (forget about MSG for a moment). It's so fun learning new dish! Thanks for sharing Tina! That recipe looks so good, oh the flavors, I can just taste them! Thanks for linking up with Fat Camp Friday @ Mangoes and Chutney, see you again next time! This recipe sounds so interesting, with lots of lovely flavours. Thank you so much for linking it up to Feed Me Tweet Me Follow Me Home last week! Hope to see you again this week.